Nam graduated with a Bachelor of Extension and Rural Development from Hue University of Agriculture and Forestry (HUAF), Vietnam in 2006. Since then he has been working at HUAF as a lecturer and researcher in the Faculty of Extension and Rural Development. In 2012 Nam gained a Master’s degree in Rural Economic and Sociology in a joint program between Leige University, Belgium and Ha Noi University of Agriculture. Nam has conducted research in agricultural value chains, enhancing smallholder farmer production capacity, and farmer association development. He has extensive experience working with projects on rural livelihood in upland area of Vietnam, so he has a strong understanding about social and economic status of upland communities. Nam is a collaborator in the research project on Assessing Adaptive Capacities of Selected Upland Farming Communities in Southeast Asia: Case of Timor-Leste, Philippines and Vietnam funded by IFS. 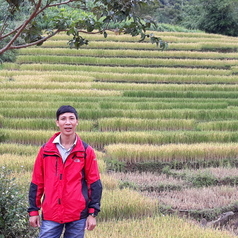 Nam is also a team member in the ACIAR-funded research project LPS/2012/062 Developing profitable and sustainable beef cattle production in Central Vietnam, co-led by UTAS and HUAF where he plays a key role in the Understanding knowledge exchange and adoption pathways component. •	Enhancing capacity of self-help groups in agriculture production in Quang Tri province, Vietnam.